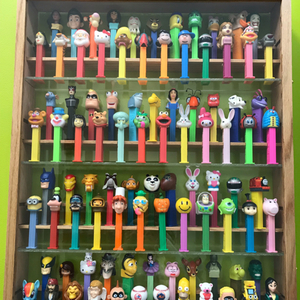 Nostalgia, favorite characters, happy faces, bright, irresistible colors - all of that captures the incredible collection of PEZ dispensers now on display at the Westchester Children's Museum in Rye, NY. Many thanks to David Weinreb, from Purchase, NY, who donated a portion of his vast collection to the Museum. David has had a passion for PEZ since he was 11 years old; he is now a teacher at Fair Haven School in Fair Haven, NJ. A special shout out to his mom, Wendy Woodrow Weinreb, for connecting David and his collection to the Museum so everyone can enjoy it. The Westchester Children's Museum is a non-profit, interactive place for play and discovery. Located next door to Playland Amusement Park, overlooking the Boardwalk. OPEN YEAR ROUND.